They have now updated the design to conform to modern safety standards and have achieved an impressive dual certification standard, adhering to both DOT and ECE 22.05 norms. What makes this even more remarkable is the fact that they’ve achieved this, yet managed to keep the Speedster’s ultra-low profile. 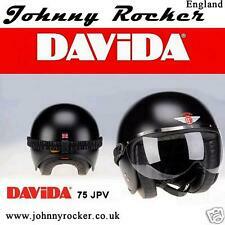 Davida's Visor Looks cool and avoids nasty bugs and fings The Davida Universal Jet Visor Smoke lig ht lint. Riveted to Stainless Steel Rim Finished with rubber trimming with headband fixed securely with robust stud. Davida Universal Leather Face Mask. Specification for Davida Universal Face Mask WE ARE AN AUTHORISED DAVIDA DEALER. Made from the highest quality through-dyed leather which will not bleed when wet or colour fade in the sun. Making maximum use of Davida's unique & ground breaking ergonomic technology & design process. The Jet is Davida's ultimate. Hand Crafted By Davida In The UK. S100 Cleaning Products, Silkolene Oil, Vance & Hines.